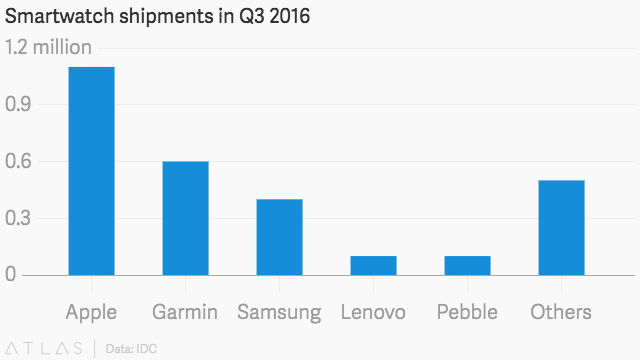 SmartWatch Market Declined 52% for Q3 2016. ​It seems like smartwatch fans are numbered. Smartwatch sales declined 51.6% worldwide to 2.7 million in the third quarter, compared to 5.6 million shipments a year earlier, according to a new report published by International Data Analytics today (Oct. 24). Much of the downturn can be credited to the market leader, Apple, which saw sales of its Apple Watch plummet over 70% to 1.1 million. 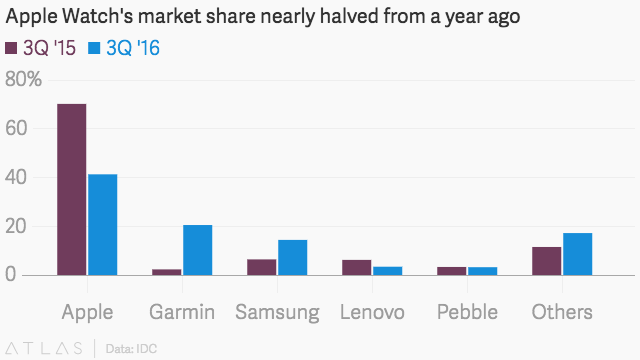 With 41% of the market share, Apple is still leading. However, it’s a huge slip from the 72% it captured in the third quarter of 2015. A big part of the issue for Apple is timing. The refreshed Apple Watch was released just two weeks before the end of the quarter, while the original watch debuted in May 2015. With “lower price points and improved experiences, Apple could be heading for a sequential rebound in 4Q16,” IDC wrote in its report. Beyond Apple’s limited sales, Google and Samsung didn’t release wearables during the third quarter, which “left vendors relying on older, aging devices to satisfy customers,” noted Ramon Llamas, research manager for IDC’s Wearables team. While devices like the Apple Watch come loaded with a variety of apps, the only clear use cases so far for such wearables are receiving notifications and tracking fitness activities. For some users, the former is less of a convenience and more of an anxiety-inducing function. But health is showing showing real promise. Doctors have recommended that patients use fitness trackers, and, last month, Aetna Insurance announced plans to subsidize the Apple Watch for its customers. 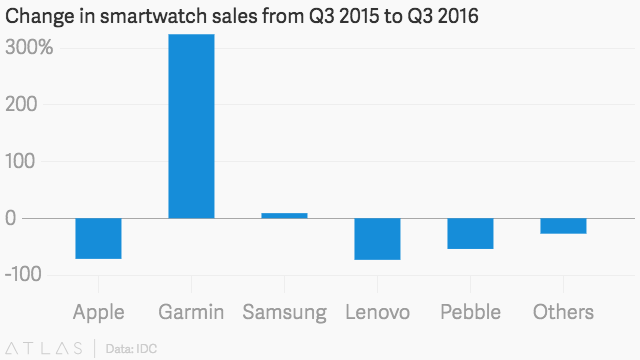 For further proof that smartwatches are gaining traction as fitness devices, just look to Garmin. The company’s whopping 324% increase in sales from the year prior is “thanks to its growing list of ConnectIQ-enabled smartwatches and the addition of the fenix Chronos,” according to the report. Instead of trying to diversify into multi-purposes devices, like the Apple Watch, Garmin focused solely on health and fitness. The 600,000 units it shipped in the third quarter were second only to Apple. Apple seems to be going in this direction as well, positioning the latest iterations of the Apple Watch to fitness aficionados with waterproofing, built-in GPS, and more health and fitness-oriented apps. There’s even the Apple Watch Nike+ aimed squarely at the running set.